We’re seeing a real shift towards comfort and warmth. So before you make design plans and go shopping check out what’s in the forecast for this coming year. If those cold grey tones didn’t feel right to you, you are not alone. Next year people are craving the warmth and comfort of earth tones again. Remember those mocha beige colours? The warmth of brown and beige tones creates a relaxing warm feeling in any room. So no matter how busy your schedule, once someone settles in at home they can feel relaxing comfort. Never underestimate the importance of texture in design. Mixing and matching textures is a key ingredient in interior design. Without texture the space will look and feel “flat” and uninspired. Texture creates visual interest in a space. It adds layers of experience for a more luxurious feel and appeals to your senses by adding interest and depth. Texture can be visual as well as tactile. By combining contrasting textures such as fuzzy wool with smooth silk, matte tile with a glossy countertop or printed with solid fabrics, you can create a mood that is truly inviting and memorable, adding to the experience of the room. Adding a minimal amount of colour to a neutral space adds interest and personality. You can add a colourful flower or plant. Create a vignette such as a grouping of coloured vases on display. Spruce things up with a colourful art piece on the wall. Toss a vibrant throw pillow or blanket on the couch. The key is to keep the background simple and let your accessories take center stage. Limiting to 1 main colour and 2 accent colours. If you go crazy with accent pieces you’ll distract from the cozy, cohesiveness of the room. So stick to one or two accent colours for the room. This will create a layered look that still feels inviting. Antiques are making a huge comeback. People are yearning for the comfort of yesterday. Finding ways to recycle and repurpose items makes for clever and earth-friendly design. Vintage light fixtures are in high demand. Why have something from a big-box store when a vintage light fixture is unique, unusual and adds an interesting element to the room? Recycled items save money and help create truly personal, eco-friendly and attractive living spaces. Think outside the box. Come up with ideas to reuse, recycle, and upcycle what you have. Visit an antique or resale shop. Find ways to put a stamp of your personal style on your home. There you have it! 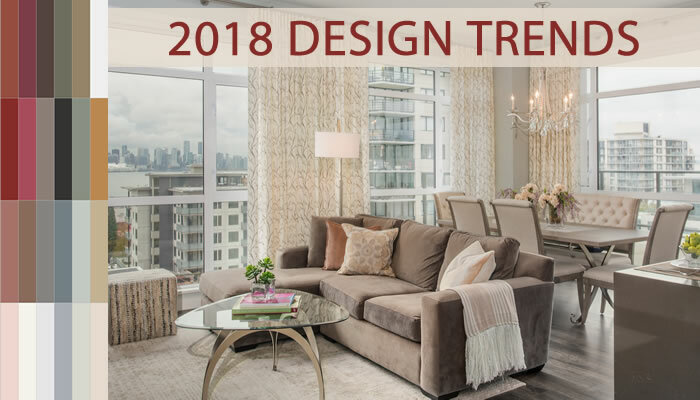 These are the interior design trends that will shape this coming year! Share your thoughts in the comments section below. If you live in the North Vancouver area and want to learn ideas for remodeling or redecorating we invite you to contact us for a design consultation here.